Home › Latest News › The Street® 750 - A motorcycle not to be taken lightly! The Street® 750 - A motorcycle not to be taken lightly! In 2015, Harley® released the Street® 750 motorcycle. This is a machine built to let you shred traffic in plenty of Dark Custom™ style. Liquid-cooled engine. Quick handling. A suspension tuned for rough pavement. Fire up the blacked out engine, send some sound out the blacked out pipes, and get behind the café racer windscreen and go. Consider the traffic whipped. first time I overtook a car. This bike packs plenty torque and responds quickly to the twist of the throttle. Second thing I noticed, were the brakes. The Street® 750 does not waste time clamping the wheels when coming to a stop. Rest assured, if you need to make an emergency brake for whatever reason, this bike has got you covered! A difference from smaller Harley® motorcycles that I also picked up on, was the fact that the clutch releases a bit later than other Harley® models (besides the V-Rod®). It took a little concentration in the beginning to get used to the clutch as opposed to the other bikes that I had gotten used to while practicing in the parking lot. Thanks to its low weight and low center of gravity, it makes pulling out from the curb feel as effortless as putting your thumb to the starter button. Cornering is a breeze! 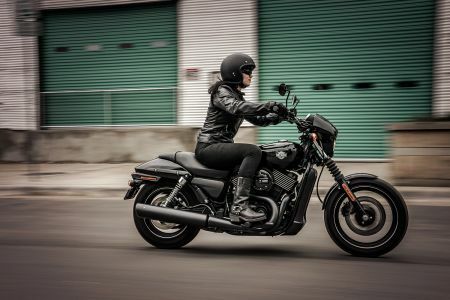 The Harley-Davidson®Street® 750 motorcycle features slightly-forward mid-mount foot controls for a riding position that keeps you comfortable, but ready to respond to traffic conditions as they arise. The rake and trail angles on the front end of the Harley-Davidson® Street® 750 motorcycle are optimized for low speed maneuverability. So whether you’re trying to find a parking spot in the lot outside a club or making your way through an alley choked with obstacles, you’ve got a predictable ride and the confidence that comes with it. This adds to the fact that this a bike well-suited to every day commuting. The Street® 750 motorcycle feeds the power of the Revolution X™ engine to the pavement through a rock-solid, smooth-shifting 6-Speed Transmission. It’s easy to stay in the powerband when you’re changing speeds and weaving and dodging in traffic. And when you do get onto an open stretch of road, sixth gear lets you drop the engine into an easy, loping cadence for a smooth, comfortable ride. Overall, the Street® 750 is perfectly suited to everyday commuting, as well as being a great choice when first getting into the brand and cruising lifestyle! Personal opinion? I love this motorcycle!